4 bundles of found branches tied with wire, 4 imperfect found stones, wireless video camera. monitors where the number 4 appears. outside inside. The piece brings something outside of the physical being inside via the eyes (blinking, calculating) and the mind (thinking, feeling), creating a mirror image of the tree outside in real time. This piece is also about perception-a moment in time of a given view seen inside with elements from the outside inside. 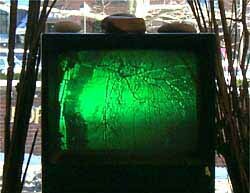 Electricity flowing from the outside through wires into the electrical outlet into the monitors capturing the image of the tree and wires in real time with the camera transmitting the image in real time to the monitor via the wireless camera outside to theinside via the electron gun illuminating the phosphors on the inside edge of the monitors. The moment in time transmitted to the viewer is existential. A single moment and view from a series of moments and views that is forever changing in a state of flux. Imperceptibly a moment passes and the tree, the light, the environment changes as does the viewer. The viewer sees the tree and in that moment the tree ages as does the viewer; time has passed. This happens so slowly that one can barely notice it. The installation portrays a real, physical world in motion, the tree grows and has changes during the duration as it is viewed. There is also movement that is imperceptible: the movement of electricity through the telephone/electrical wires outside, and the movement of electricity through the camera and monitors that allowthe image on the screen to be seen. Other changes may occur. A person or bird may pass by, the tree changes imperceptibly, as does the sky and over a longer period of time, so do the seasons. This totem of monitors is a gathering and organizing of elements into a series of 4. 4 images on 4 monitors surrounded by 4 bundles of branches with 4 stones on top of the monitors. The devices (the camera, the monitors) by their very nature are cold and technological. Natural objects are introduced into this cold and technological microcosm.The eye of the camera is a fixed-a small aspect of reality (a tree on Old Northern boulevard at a given time of day) with telephone /electrical wires sending myriad conversations and internet transmissions. The camera during the duration of the show portrays changes outside to the viewer inside the gallery, including changes in weather, in clouds, precipitation, wind, light , subtle changes in the trees growth. If viewed long enough, changes in season, the life, death, rebirth cycle (samasara). The artwork, like life, is ephemeral and temporary-the installation will have a life, death, and rebirth cycle. The number 4 is often described as a sacred number. It represents the 4 elements of the ancient alchemists: earth, air, fire, and water. It also symbolizes the 4 directions (North, South, East, West) to the American Indians. Jung spoke of the importance of balance with numbers divisible by 4. 4 is also referred to in the Kabbalah, representing the 4 worlds of existence: the world of god, the world of the archangels, the world of the angels, and the world of earthly existence. The water-like ephemeral video image flow and the stones and branches of the earth are viewed via the fire of electricity and the sun to illuminate the image of trees fed by water and with air surrounding the natural structure and physical space of the monitors and branches and stones. Making a cup of tea is itself an act of magic of the 4 elements. The tea itself is containsand is from the earth, the water is heated to a boiling point by fire and produces stream (air). The artwork is live image of the 4 elements using the 4 elements.